Sony has long been a leader when it comes to the world of audio. In fact, it is difficult to shop for electronics without thinking of Sony at some point. When you think of Sony, you think of high-quality products. Sony Corporation is based in Tokyo, Japan and Sony Corporation of America has its headquarters in New York, NY. Sony Corporation was founded in 1946 and is a global leader when it comes to electronics and entertainment. Their success is no surprise, as they are relentless in coming up with innovative technologies. 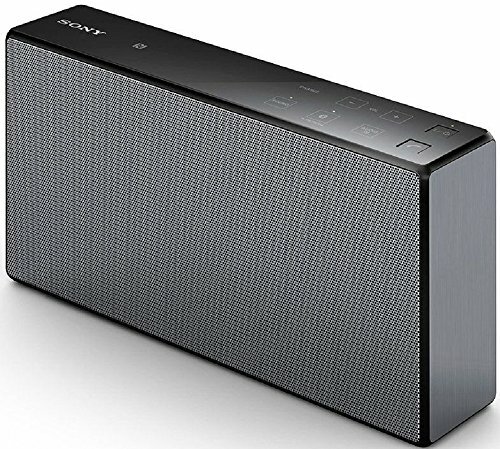 Let’s take a closer look at one of their products: the Sony SRSX55 Portable Wireless Bluetooth Speaker. The SRSX55 portable Bluetooth speaker is certainly a small powerhouse. Like any good portable speaker should, it produces great sound quality. It is small in size and has a long lasting battery life for easy portability. It is basically everything you need in a portable wireless Bluetooth speaker. Packed with 30 watts of power, this small speaker delivers a big sound. To make it even more powerful, it has a built-in subwoofer and dual passive radiators. Enjoy that deep, rich bass that everyone loves. Featuring the special Sony LDAC technology, it transmits 3 times more data other Bluetooth speakers allowing for the highest quality wireless Bluetooth connection. You will hear your music at its best. DSEE technology ensures that your music will be restored to its natural sound- bringing back the depth that is normally lost when audio files are compressed when using Bluetooth. You can listen to your music the way it was originally meant to be heard. This little powerhouse also uses ClearAudio+ technology which enhances the sound quality to produce clear highs and deep lows. The Near Field Communication feature makes it even easier to connect to Bluetooth. Simply place your NFC enabled device near the speaker and touch the NFC logos for quick pairing. You can pair any Bluetooth enabled device to start streaming your music. Use the AUX input to connect non-Bluetooth devices to start streaming your tunes. As far as battery life goes, this speaker doesn’t fall short. Enjoy up to 10-hours of listening time and when you need to recharge it, simply use the micro USB charging port on the back of the speaker to connect to a power source. The SRSX55 has a sturdy, durable feel but is also easily portable. It measures 8.8 inches by 2 inches by 4.8 inches and weighs 2.6 pounds. When your mobile device is getting low on battery, you can just use the USB port on the back of the speaker to recharge it. It can be used to charge tablets, smart phones, and digital music players. If you need to take a call, just use the built-in speakerphone to chat hands free. When you finish the call, go straight back to listening to your music. To top it off, it has a sleek design and can look good in any situation. This Sony speaker definitely rises above its competition for its superior sound quality. Many portable speakers lack a good bass, but that is not the case with this speaker. It produces a surprisingly powerful bass without drowning out the crisp treble sound. With a big sound, it can fill a room with music and is great to use for parties. Users are very happy with the quality of this speaker for the price. It is cheaper than its competitor, the Bose Soundlink Bluetooth Speaker, and most users prefer the Sony model. It connects easily to Bluetooth devices and has a good connectivity range. Users also report that it is pretty durable as well. The battery lasts a long time so it’s great to use even when there is no power source nearby. It is also very convenient that you can use it to charge your mobile device. There aren’t many bad things to say about this product. Users are largely satisfied with this purchase. Some have complained that while it produces a great bass, when it plays songs with a heavy bass it starts to distort. Some have solved this problem by downloading an equalizer app on their mobile device to reduce the bass when needed. If you plan to use this to watch movies, you can expect that the sound will be a little mismatched to the video. This is probably due to the new Bluetooth technology being used in this model. This product comes highly recommended and has great sound quality. It is everything that you need in a Bluetooth speaker.